Anthony Wong’s (黃秋生) new British television series, Strangers, recently aired its first episode. 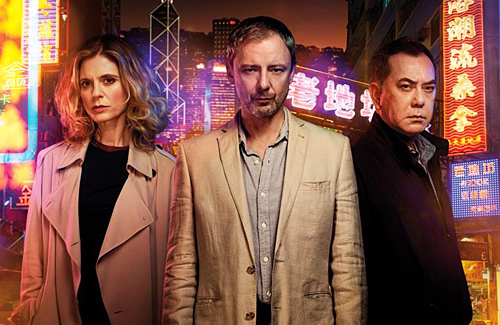 The thriller takes place in England and Hong Kong, and also stars English actor John Simm. In Strangers, Anthony plays David Chen, a hot-headed cop who leads the investigation after the sudden death of Jonah Mulray’s wife in Hong Kong. When Jonah went to identify the body, Anthony shockingly reveals that he too, has been married to Jonah’s wife, Megan, for over 20 years. The majority of the premiere episode was filmed in Hong Kong, showcasing the beautiful skyline and tall towers. The production values and details for Strangers are high, and many viewers complimented the accuracy of the Cantonese spoken in the show as well as the depiction of Hong Kong culture. Filming locations include some of Hong Kong’s signature tourist destinations such as Hong Kong International Airport, Chungking Mansions, and Ngong Ping Village. Since the series started airing in England, the Google search numbers for Hong Kong tourism have also increased 125 percent. More British viewers developed an interest in the different Hong Kong landmarks, sparking their inner travel bug. However, Strangers is not the first British production to have promoted Hong Kong tourism – series such as The Durrells and reality cooking show, Masterchef, also spurred greater interest. Well played PR people. Well played. Good for Anthony. He deserves the exposure. I can’t help but draw the parallels between his character and Anthony’s paternal father. Good to see Anthony branching out and doing quality outside projects like this. Always happy to see HK artists able to participate in projects that don’t involve them being stereotyped or a meaningless side character or whatnot. I’ve watched the first two episodes, pretty good so far, better than any thriller that HK/China can produce. Looks interesting and my favourite genre, crime thrillers. China will not be able to produce good thrillers because of censorship. They think all these murder plots will affect the audience behaviour. Korean thrillers are on another level. I mean, John Simm & Emilia Fox is in it so it should be good. The cantonese is really good, but for someone who is regularly exposed to the language, it’s still sounds weird to my ears.